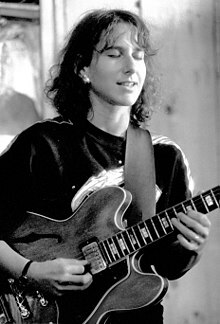 Emily Remler was an American jazz guitarist (1957-1990) influenced by Wes Montgomery amongst others. She began playing guitar when she was ten and studied music at Berklee for three years (1976-1979). She recorded as a leader for the first time in 1980 and released 7 albums : Firefly, Take two, Transitions, Catwalk, Together, East to wes and This is me. New lessons are regularly published, don't hesitate to subscribe to the newsletter. This short guitar lick with TABS show you how Emily Remler used the octave playing technique over a Bb7 chord while playing rootless dominant voicings.